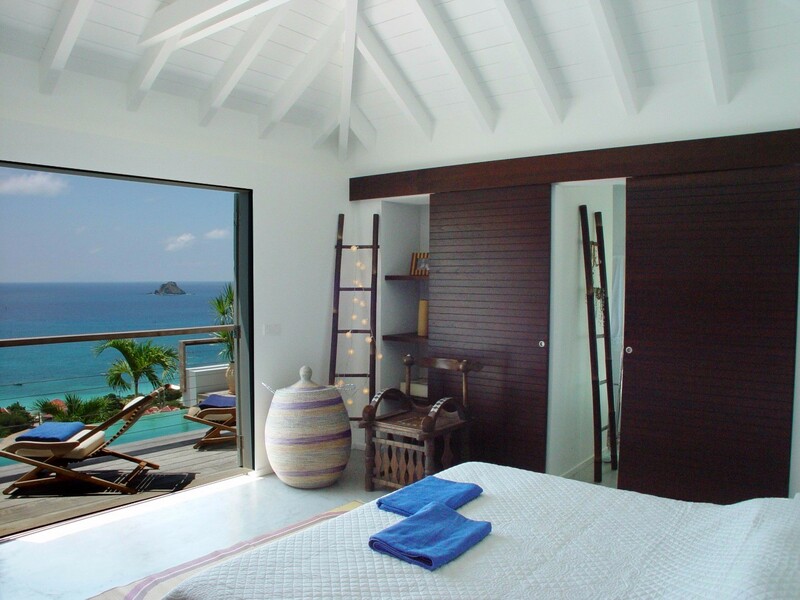 Villa Casaprima St Barts. 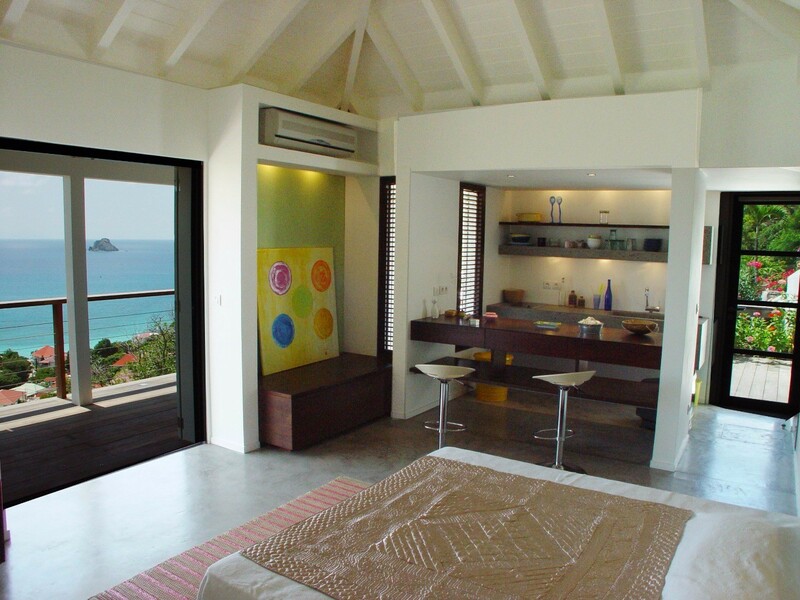 The beaches of Flamands and Corrossel are just minutes from Villa Casaprima as it sits cozily on a hillside in the Colombier area of St. Barts. With its impressive views and wonderful location, it would serve as an ideal getaway. However, the property is so rich with amenities, style and comfort that it is a dream destination on its own. The villa is designd to appeal to those who appreciate contemporary style, beautiful lines, and the opportunity to blend indoor and outdoor settings. The Villa Casaprima is surrounded by the lovely tropical growth, and the wraparound terraces of the property ensure that not one beautiful sight is missed. There are many indoor and outdoor spaces designed for maximum comfort, and the gorgeous infinity edge pool running the length of the terrace is but one example. Elegantly designed with a stone footbridge dividing the shallow from the deep end, the pool has a large sun deck nearby. 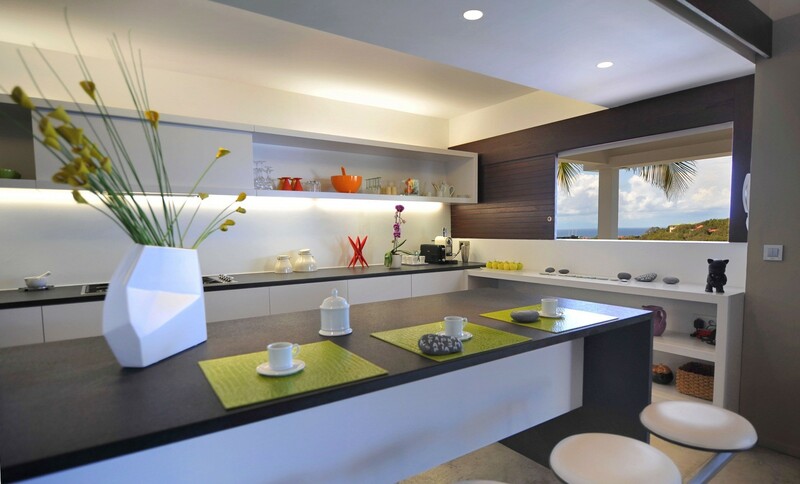 Another level up is the living area, and here the large gourmet kitchen faces outward and is separated by the sleek and casual living room by a trendy breakfast bar. The living space directly adjoins the covered terrace area where an al fresco dining room is adjacent to yet another comfortable exterior lounge. 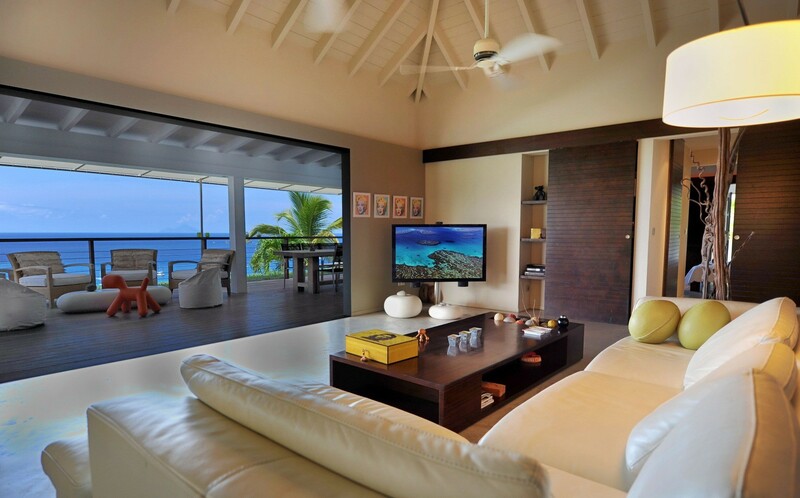 There is an entertainment system in the living area, and Wi-Fi is available throughout. Two of the three bedrooms are in the main building and a third, optimally private bedroom, has a small bungalow of its own. This features a kitchenette and bar and two twin beds. All of the bedrooms are en suite and have private terraces with views of the ocean below. A family escape, a group of friends, or even a small destination event will find the Villa Casaprima an ideal setting for an unforgettable St. Barts experience. 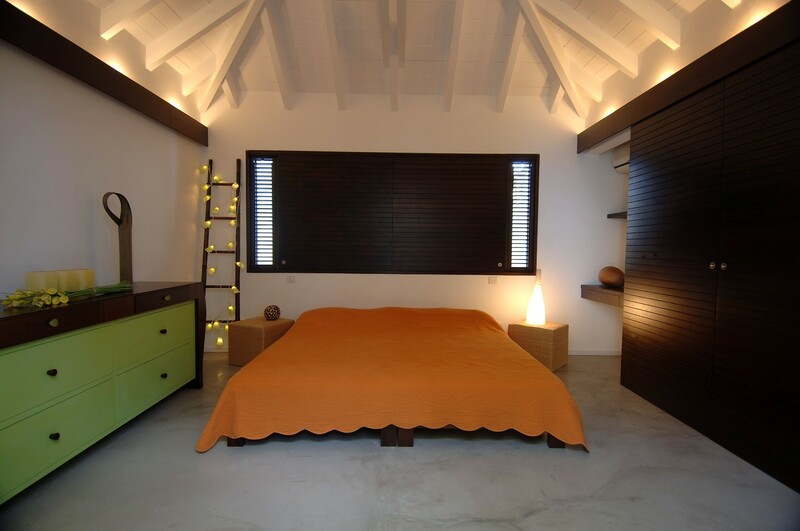 Bedroom 1 features a king size bed, ocean views, air conditioning, safe and en suite bathroom with shower. Located in the main house. 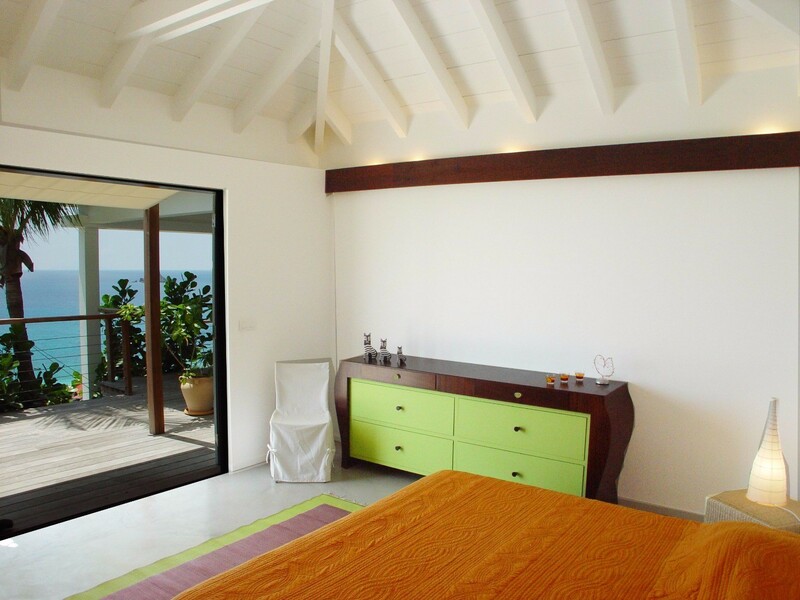 Bedroom 2 features a king size bed, ocean views, air conditioning, safe and en suite bathroom with shower. Located in the main house. Bedroom 3 is located in a separate cottage below the main house and opposite side of the drive way. Bedroom three features a king (or two twin beds), ocean views, air conditioning, safe, TV with DVD player, and en suite bathroom with shower. The cottage features a kitchenette and outdoor shower as well. Three bedrooms with three king beds. The bed in the third bedroom can be separated to be two twin beds. En suite bathrooms with showers and each bedroom is air conditioned.